Warm and cosy desserts are the flavour of this season. And if you have an incurable sweet tooth like me and think dessert even before main course then you could eat any dessert any time of the year. That said, there is something truly comforting about bread and butter pudding. Maybe the fact that it has bread, one of the most loved foods across the world, and that it has butter to add to its richness. And of course, custard! I’m yet to come across someone who doesnt care for the comfort a bowl of custard provides. Simple bread and butter in itself can be so fulfilling and comforting. Enrobed in creamy custard and baked, this is an irresistible pudding. As a matter of fact, so wonderful that I could skip a meal or eat it sparsely to make room for this pudding. And it only helps that this is a really flexible recipe. You could use any bread, store bought or home made. I used whole wheat bread to utilize the excessive bread in my pantry. But I prefer the taste of white bread in this pudding. You can increase or decrease the bread to custard ratio depending on how liquid you want your pudding to be. I like to keep varying this, at times lightly coating the bread cubes with the custard and at other times submerging the bread in a pool of custard. And you could use any berries instead of strawberries or other nuts like almonds or pecans instead of walnuts. Or skip the fruits and nut and enjoy the regalness of plain bread and butter pudding. The best part of my cooking these days is that Harivansh gets to taste most of it. He is still cultivating his taste buds and exploring different foods but his clarity and specific tastes or for that matter his dislike towards certain foods continues to stun and surprise me. To add to the comfort of this pudding was the fact that both my men relished it. I hope you will forgive me for using the term "comfort" time and again in this post but trust me that's how comforting it is! However you decide to make this, I hope you find the same comfort that I do when I dig into a bowl of this pudding. 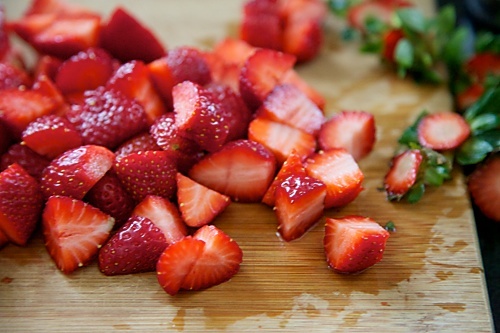 The strawberries can be replaced with other berries like raspberries, blackberries or blueberries and the walnuts with almonds or pecans. 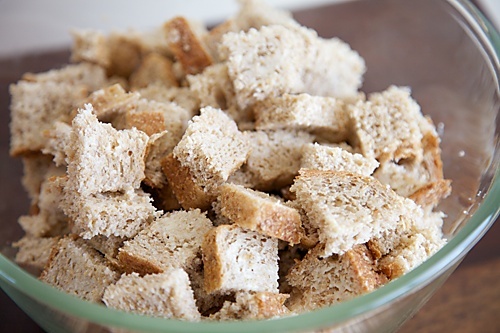 The cubed bread can be toasted in an oven for ten minutes and then baked as given below. This recipe will coat the bread lightly with the custard. If you want more of the custard, then use only 3 cups of bread. All the other ingredients can remain the same. Preheat the oven to 190C/350 F. Brush an 8” round oven proof pan with the butter and sprinkle with 1 tbsp demerara sugar all over it. In a small bowl, put in the custard powder and mix with a little milk (1/4 cup) to form a smooth paste. Heat the remaining milk with the sugar on a medium flame until the sugar melts. 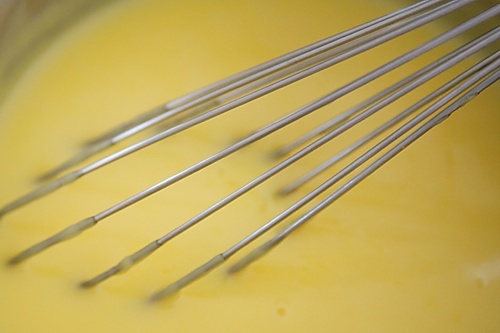 Lower the flame and slowly mix in the prepared custard paste and cook until thick and smooth and the liquid coats the back of a spoon, about 2 to 3 minutes. Keep aside. Butter the bread on both sides and cut into 1 “ cubes. You could lightly toast these in the oven or use them as it is. 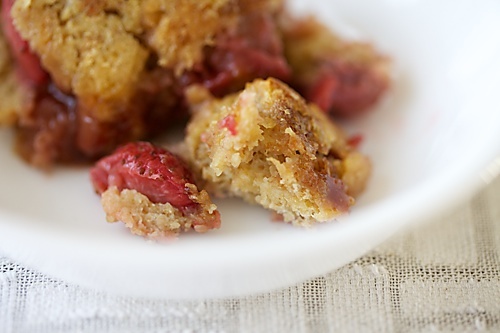 Place these bread cubes in a large bowl and mix in the strawberries and walnuts. Pour in the prepared custard and toss to coat. Pour the bread, berries and custard mixture into the prepared baking dish. Sprinkle with the remaining demerara sugar and cover the dish with aluminium foil. After about 20 minutes, rotate the dish and remove the foil. Bake until the top is crisp and toasted, about 20 minutes or more. Makes one 8" round pudding, which would make 4 to 6 servings. I absolutely adore such simple recipes which gives you the ultimate comfort food.I would count this as one! 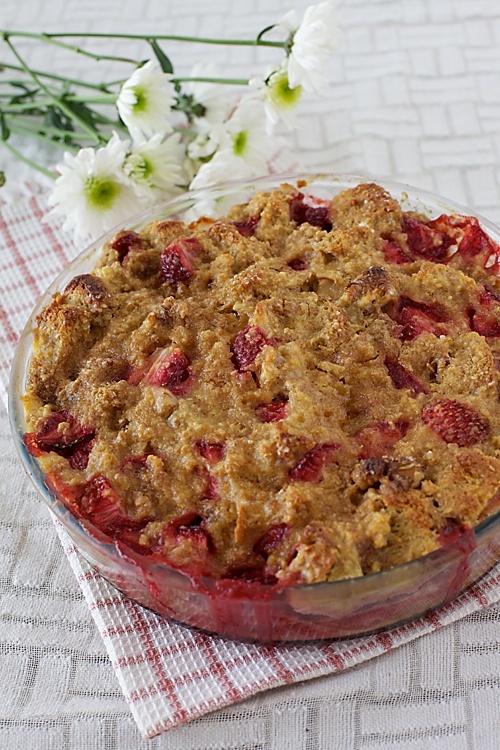 !Love this absolutely–Strawberries have not yet started appearing here[and those which have are terribly expensive].I'll try a first batch with just bread and custard…yum,can't wait to make this!! Looks so lovely and tempting! Excellent looking pudding looks so tempting.. Thank you everybody. This is a really wonderful pudding! Simi: I mean just rotate the dish for even cooking. Not the contents inside the dish! I am regular viewer of your site. However in the past few days i have been trying a lot of your recipes. The soaring prices of onion has made your recipes very popular in my kitchen. Thank you for sharing them and indirectly cutting down my household budget…!!! Veena: That is indeed a very nice compliment. Thank you for writing in! Looks yum.will be trying this soon.Was going thro your archives could not find the receipe for walnut date cookie.Could you post the receipe.Thanks. I am huge fan of bread pudding and this reminds me of my childhood. Lovely photography too! I started the new year with something sweet, (I have a sweet tooth) and that sweet was this yummy bread pudding! I just loved the pudding…. its the ultimate comfort food…. my friends and family relished every spoon and its was over in no time! Thanks for sharing such excellent egg-less dessert recipes, Anushruti. Good recipes without egg are rare to find, even on the net. Gauri: I'm so happy you made everyone happy with this pudding. And thank you for all the compliments. Tried this recipe. My husband loved it. Thanks a lot! waiting for you to post an eggless tiramisu! sun: Thanks for your feedback. Glad you loved it! Will post a tiramisu as and when possible. I love anything sweet! This a pudding I need to have soon! Hey, I love ur recipes n infact off late hv bcum a big fan of urs n have been tellin everyone I knw abt DIVINE TASTE………..
like wise I loved this one of urs…. Truely comfortin n worth skippin a meal. Kushboo: Thanks for your appreciation. Yes…this is worth skipping a meal maybe! ritu: You can make it without the strawberries or with any other berries or even dried berries. Dr.Saira Ahmed: Greetings to you too! Thanks so much for the feedback! Y is it imp to cover with foil?? Pratibha: So that the pudding doesnt get burnt. 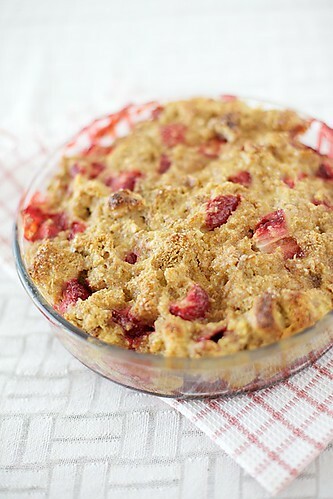 I am so temped to make this today, hv too many berries at home but not custard! Can I use condensed milk instead? Anju: You could..I'm sure it would taste great (anything with condensed milk does! 😉 ) but the outcome wont be the same. It would be a twist to this pudding. Let me know how it turned out if you happen to try it. keep it up! I'll go ahead and bokmark your website to come back latewr on.